Did you know that 93% of businesses that suffer significant data loss close within 5 years? When disaster strikes, you want to be sure your business is prepared. From Houston hurricanes to cyber attacks and system failures, these catastrophic events can devastate your business. 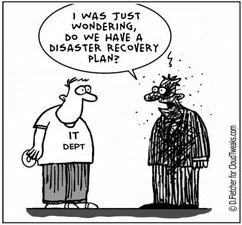 Backup and recovery options are a critical part of your business continuity plan. The modern business functions on databases containing client details, software, files, folders and more. Secured and backed up data is crucial to your day-to-day operation. Data recovery solutions prevent loss of resources, time, and valuable information. Without a backup plan, your business data (and your business) is at serious risk. Use our Recovery Time Calculator to discover how a significant disaster or data loss could affect your business. Would your business survive a flood, ransomware attack or server failure? If you’ve had the same basic backup strategy for many years, you may not fare well in the face of disaster. If your computer backup consists of disk, hard drive or cloud storage alone, your business information is vulnerable. Depending on one method can prove disastrous if that backup is compromised, leading to excessive downtime and massive loss of data. Embrace a layered backup strategy instead, with various levels of security and on-site data storage complementing cloud backups. Disasters come in many forms – from human error and cybertheft to computer viruses. But these unfortunate events don’t have to spell catastrophe for your business. Armed with a layered backup strategy and customized business continuity plan, you can carry on with business as usual through any disaster. Have a plan. Never lose important data again. In the event that your systems crash, having data backup and recovery is absolutely vital for your business to continue. Databases containing client details, financial information, software, files, and folders must be regularly backed up and stored securely to ensure you never lose what you’ve worked so hard to build. Not sure how to get started? We’ll protect your data and create local backups on our servers. You’ll get unlimited storage and can choose from our many data backup solutions. Regular checkups will ensure your data is safe and stored automatically, eliminating the threat of human error. Never wait hours or days to access recovered data. With our backup services, you can get back to work within minutes. Contact us to learn more about how we can customize our data backup solutions to fit your needs. Or fill out the form below to get started with a free estimate for services.